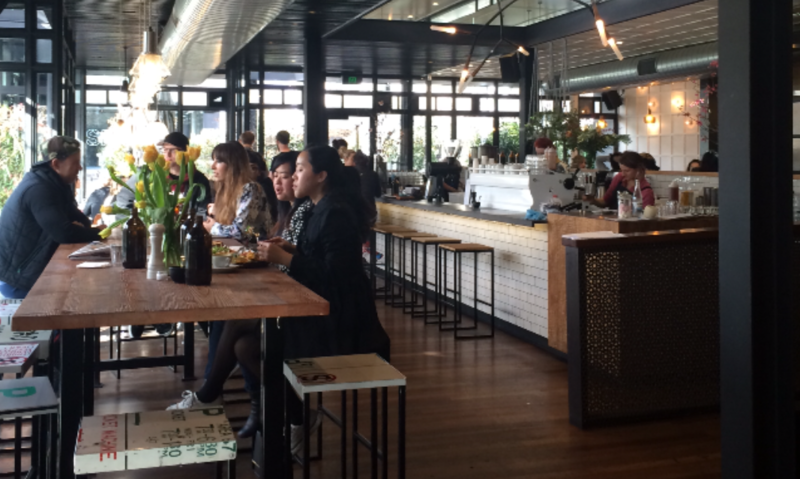 When you’re looking for a place to brunch, Richmond has plenty on offer. 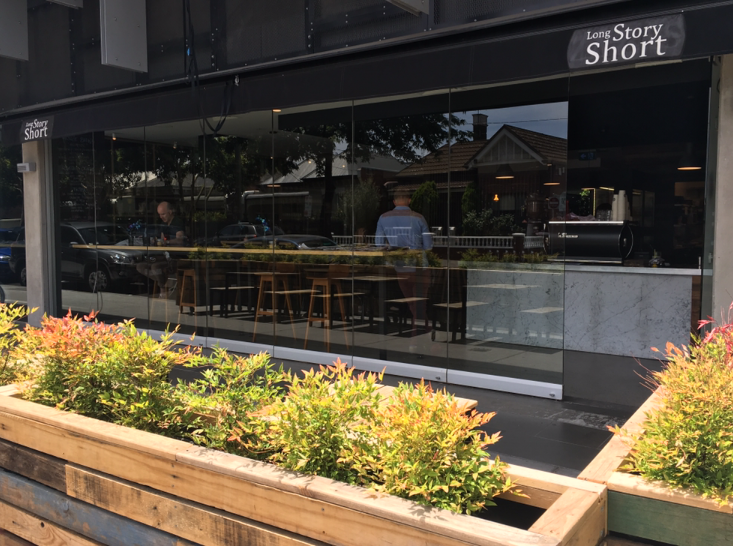 And Long Story Short has a relaxed space with an exciting menu to satisfy your brunching needs. 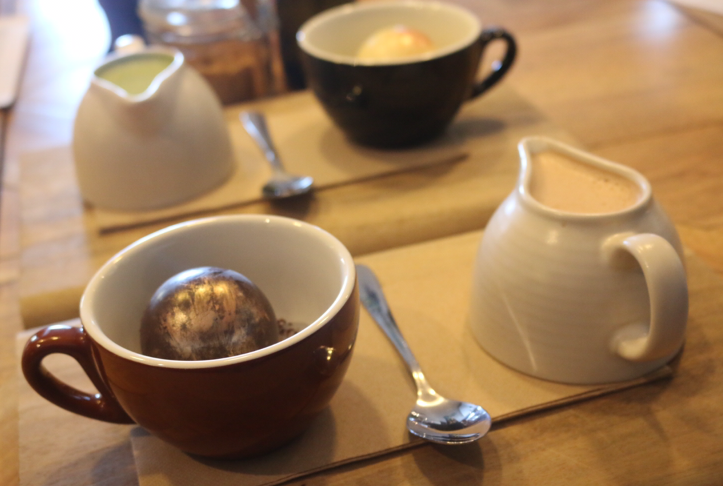 Did I mention they have awesome hot chocolate spheres with marshmallows inside. Yep, that alone is a pretty good reason to visit. 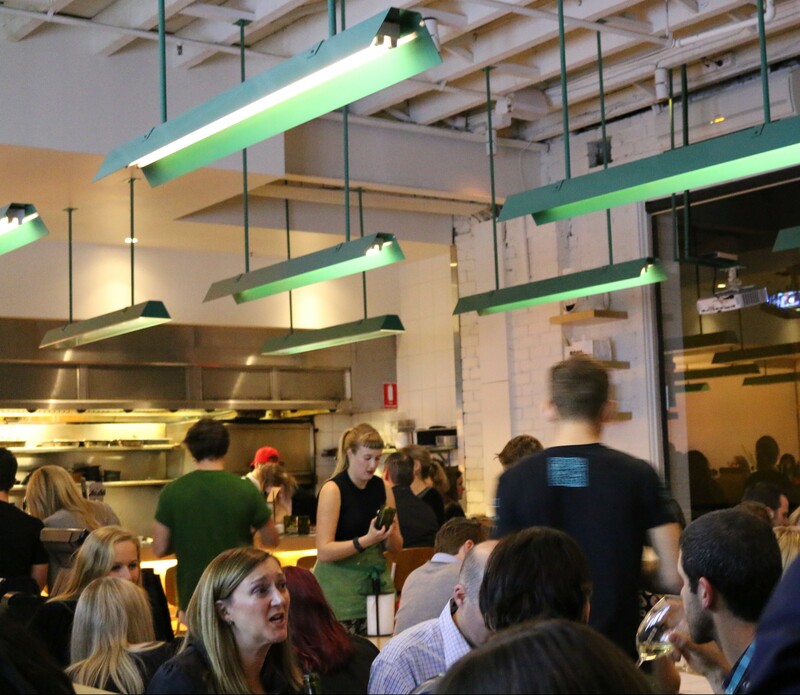 The venue has a relaxed vibe with modern wooden furniture and low hanging lights. 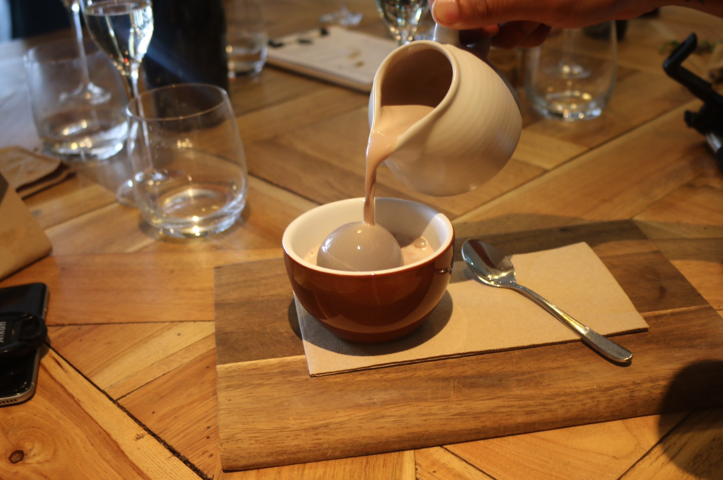 Hot chocolate at Long Story Short is quite the experience. You pour the hot chocolate over the sisko chocolate sphere and it melts down and surprise marshmallows pop up. It’s heaps of fun and delicious too. But a heads up for the photo enthusiasts, eventually the hot chocolate will go cold so make your photo session a quick one. 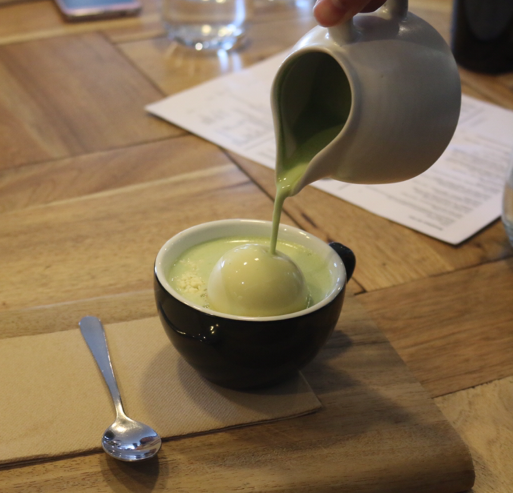 There were two flavours, a milk hot chocolate and a matcha maiden white hot chocolate. 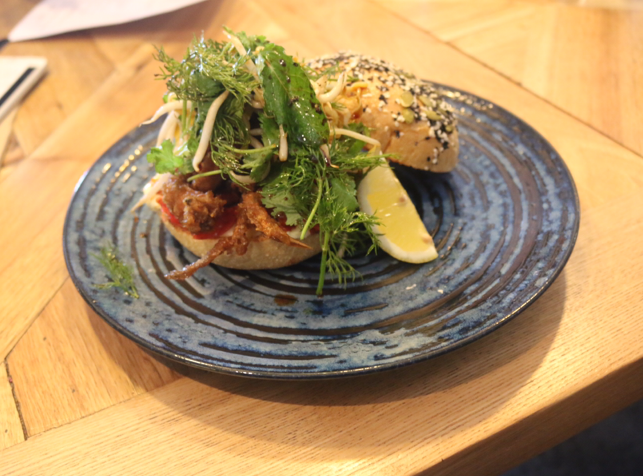 The soft shell crab was crunchy and the burger bun was covered in seeds (sesame, pumpkin), which added a nice texture. It was filled with fresh herbs and slaw. 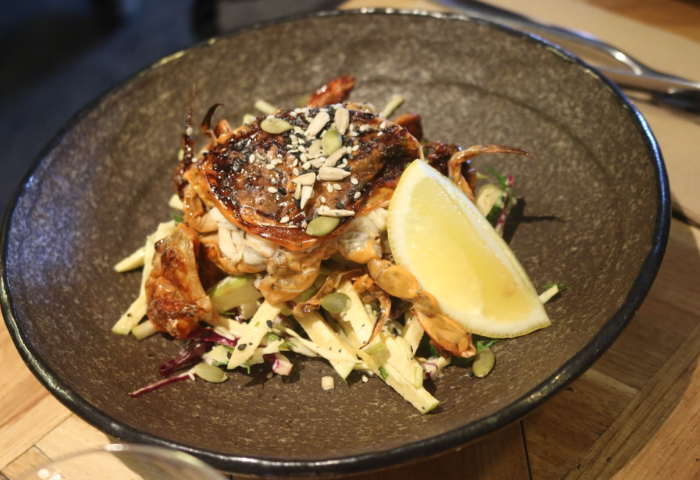 If buns are too carby for you, they also do a soft shell crab salad which is the crispy fried soft shell on top of a fresh and crunchy slaw. The pork ribs were tasty and tender. 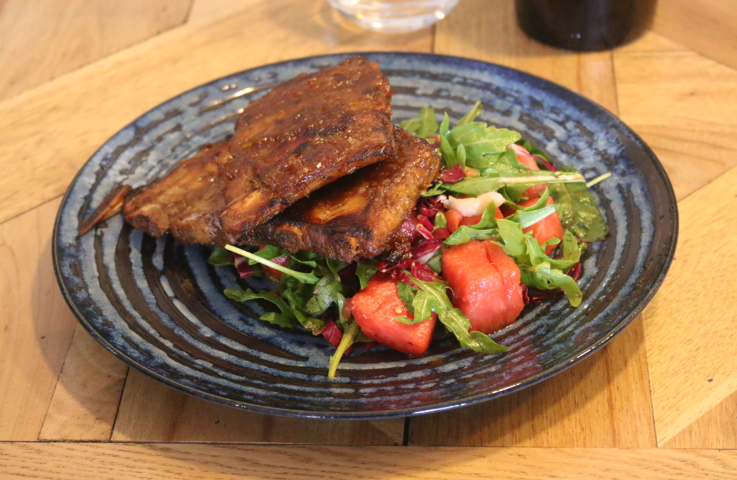 It was served with a savoury salad with watermelon pieces. I loved the watermelon it was fresh and went well with the ribs. Yum. Can’t go wrong with chilli scramble. 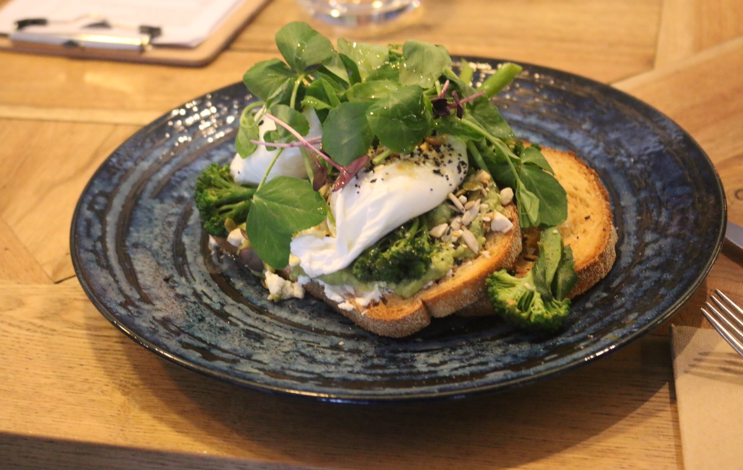 A brunch staple, smashed avo with poachies. 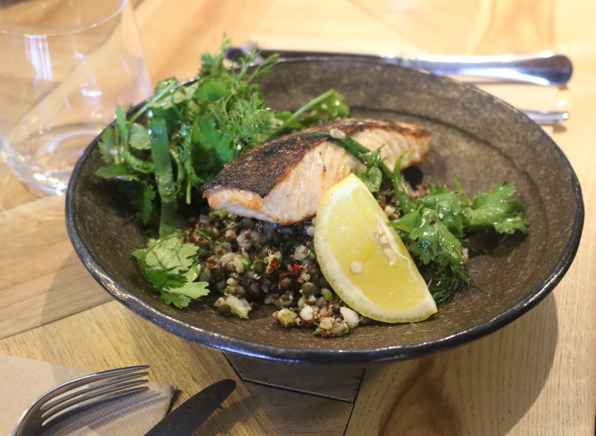 Salmon with crispy skin and grain salad with lots of texture. Quinoa, buckwheat, lentils, barley, dried grapes, almonds and fresh herbs. 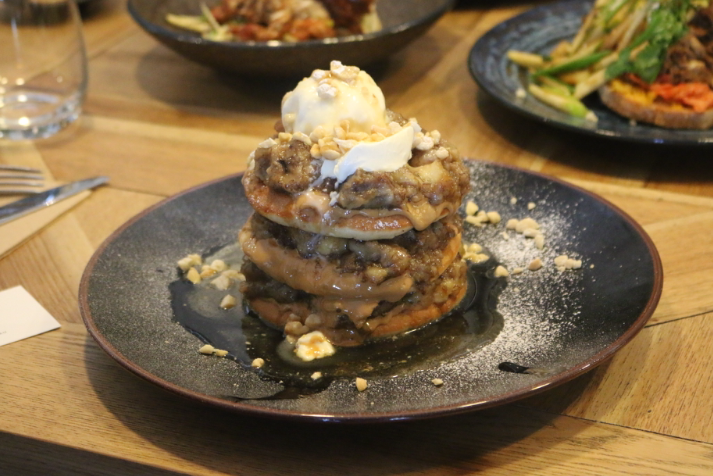 The Pepe Saya buttermilk pancakes were thick and fluffy (very filling) and had layers of caramalised banana and peanut butter in between. It was topped with a sour cream and vanilla ice cream. 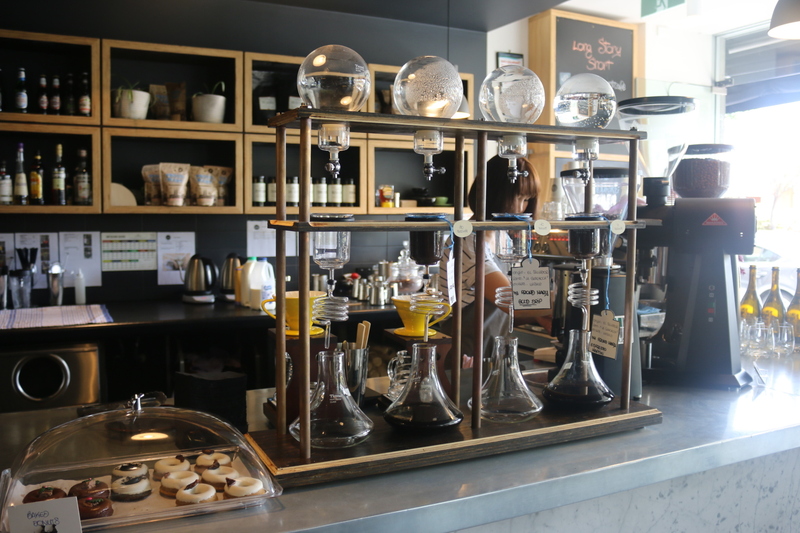 They have cold drip coffee with different drop times so you can decide how strong you want it. It starts from 10 seconds and goes up to a 60 second drop. The longer the time between drops, the stronger the coffee. 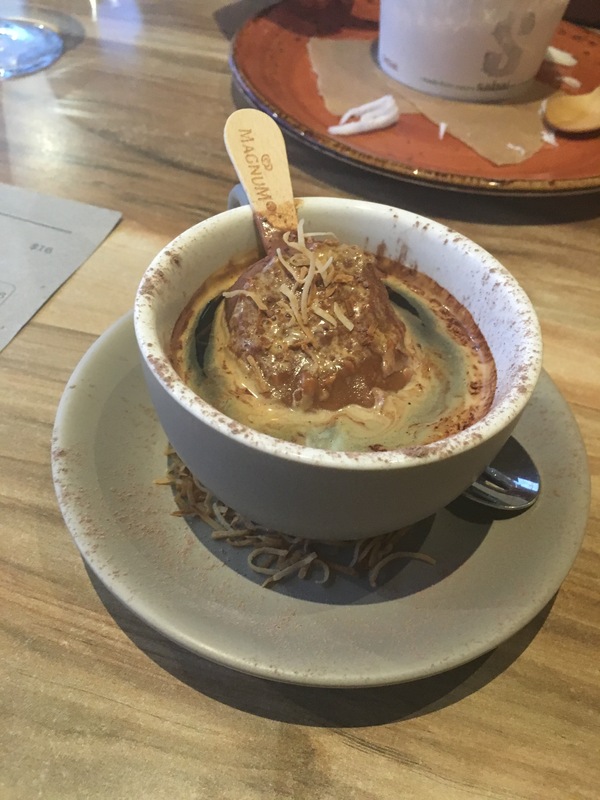 In short, the coffee is strong, the hot chocolates are awesome and it’s a great place to enjoy some tasty food for brunch. I heart Long Story Short! Note: Olive Sundays was invited as a guest to Long Story Short. Kong is owned by the same people who do chin chin and baby pizza, The Lucas Group. 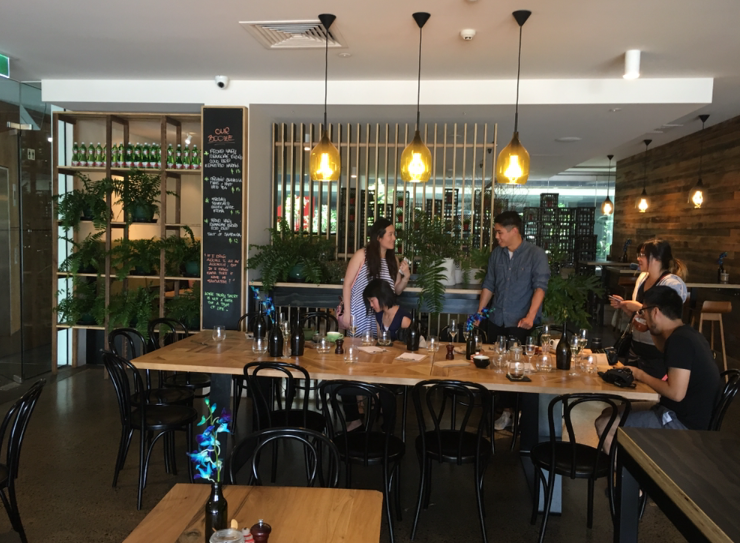 And like its other restaurant counterparts, it has a cool vibe and has people queuing out the door for quality dining. 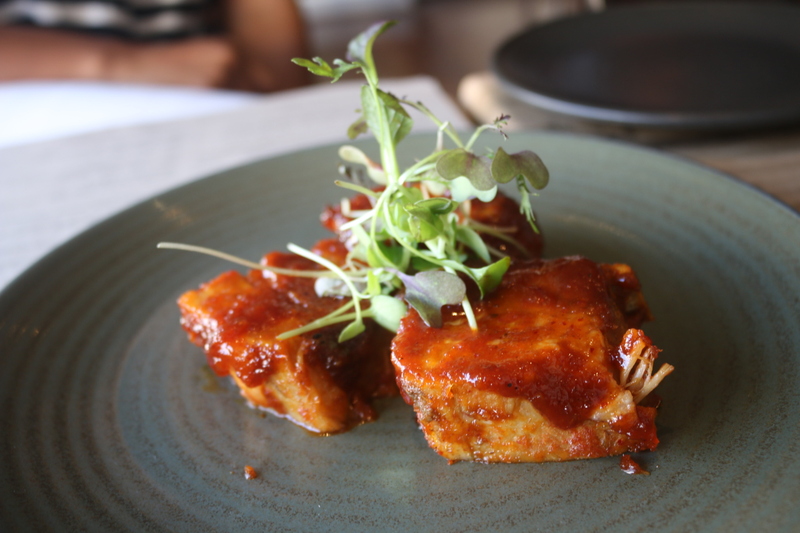 Kong creates modern dishes with Korean inspired flavours, lots of intense flavours and lots of BBQ’d things. The endamame was delish. They saw some heat on the wood grill and were seasoned with chilli & sea salt. Excellent starter. 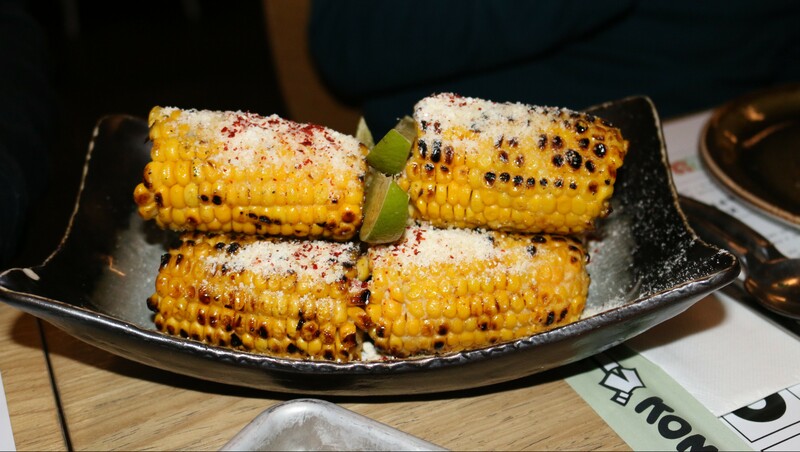 The BBQ corn was juicy and had a nice char to it. It was covered in a delicious miso butter and sprinkled with chilli salt. 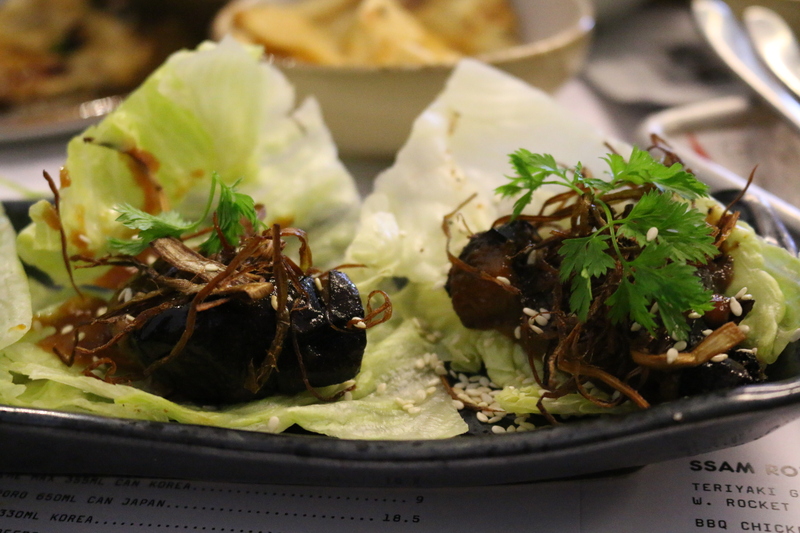 The miso eggplant was beautifully caramelised. And it was served in iceburg lettuce with sesame, chervil & yuzu. Easy to eat and really tasty. 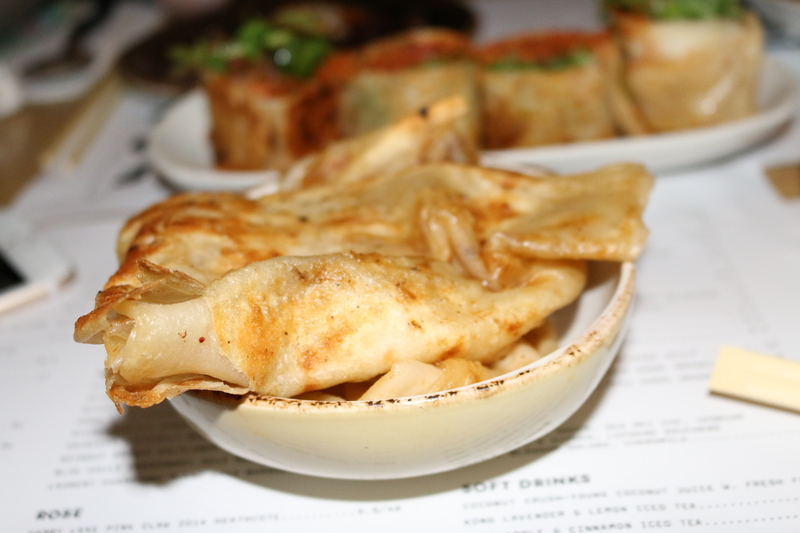 The roti was nice and soft and was a good dipping tool to savour all the flavour in the saucy dishes. 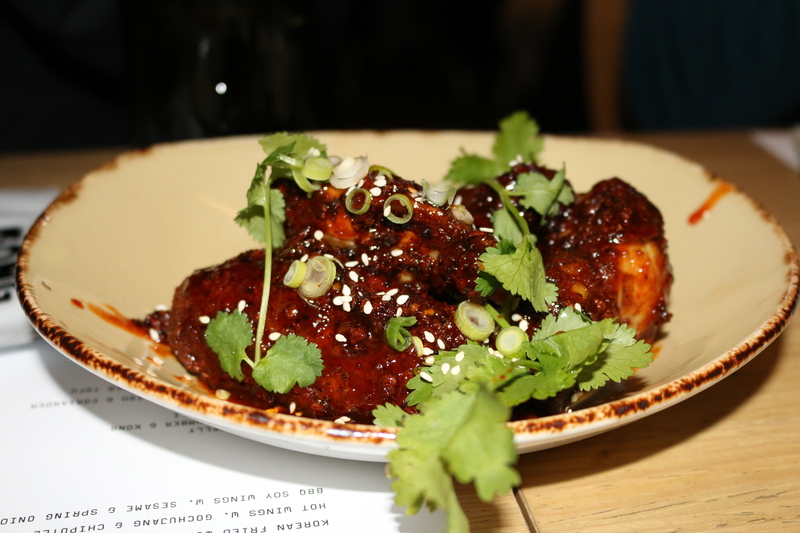 The Korean fried chicken wings were doused in a thick, sticky honey garlic sauce and was topped with sesame seeds, spring onion and coriander. The sauce was really flavoursome and intense. They were super tasty but I couldn’t eat a lot of them in a row. 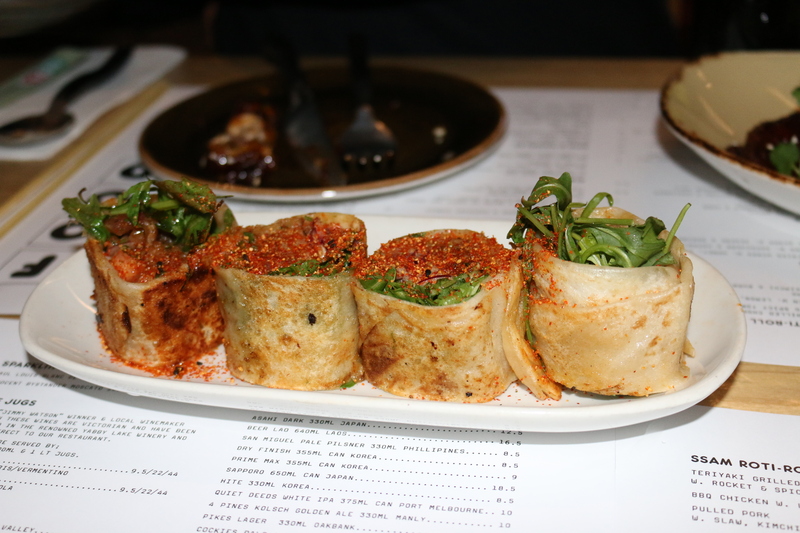 We had the salmon roti rolls which was teriyaki grilled salmon w rocket and spicy tomato salsa. I knew it was salmon because I ordered it but otherwise I wouldn’t have known it was salmon. It was okay but probably my least fave of the night. 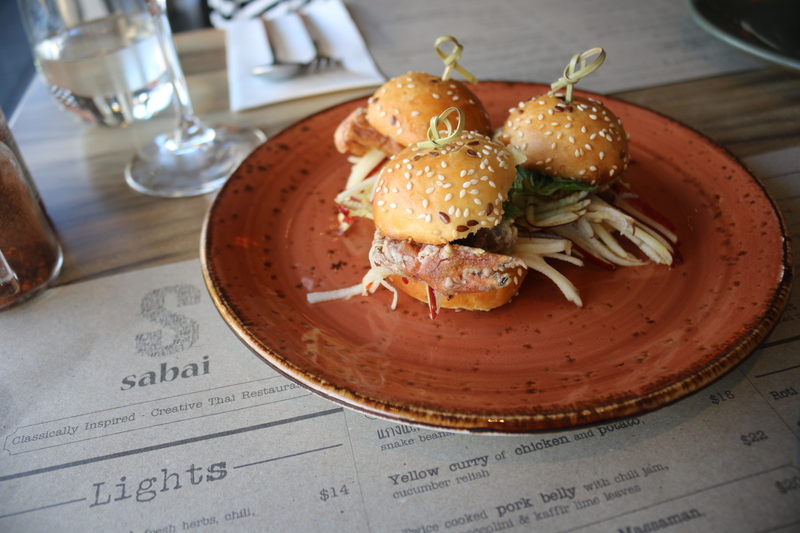 We tried the soft-shell crab with salted duck egg relish & coriander. 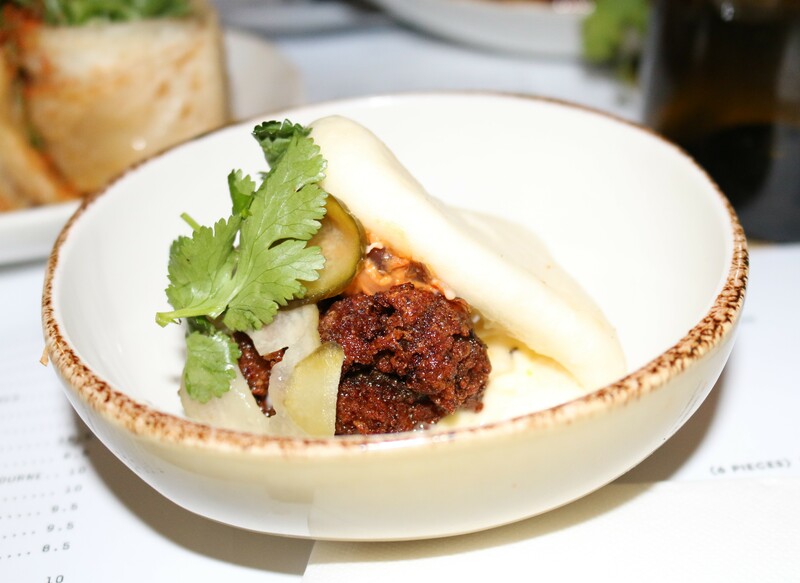 The bao was so soft and smooth, I was patting it like it was my little pet. It was crunchy, tangy, fresh and delicious. Yum! 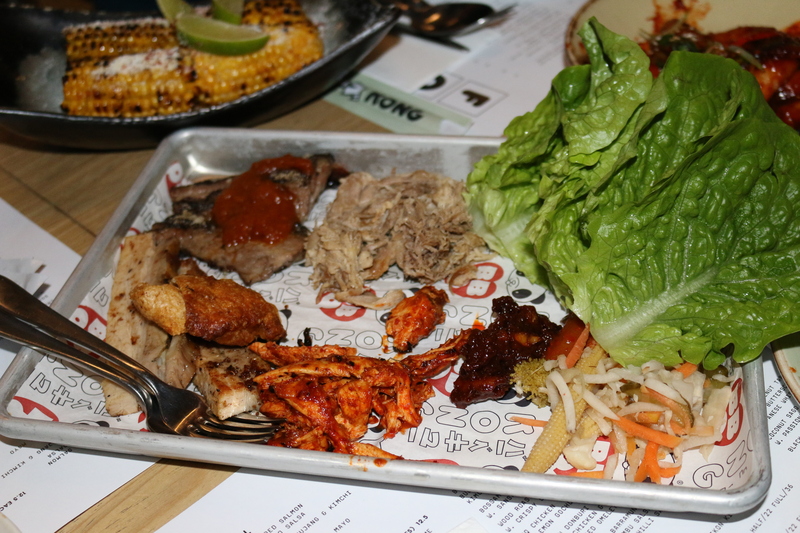 The Kong Bossam BBQ tray was a platter of different meats, which included a little tasting of pulled chicken & pork, pork belly & beef brisket. The meats were tasty and had different flavours and textures. There was some lettuce leaves to put the meat in and pickled veg for freshness and some tasty condiments like kimchi & walnut ssamjang to add a chilli kick. Very tasty indeed. 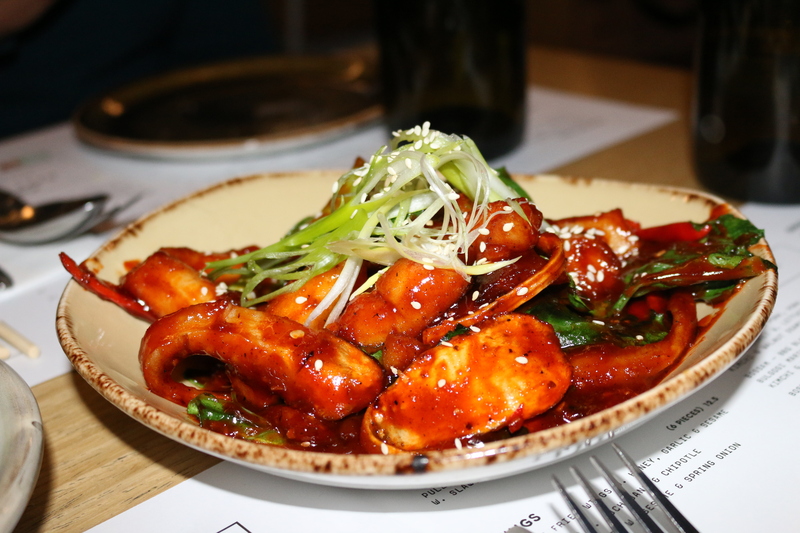 The Dukkbokki rice-cakes were sort of like over-sized, oddly shaped noodles that resembled little alien tenticles. The sauce was thick, spicy and delicious. It had red chilli, gochujang & roasted parsnip. 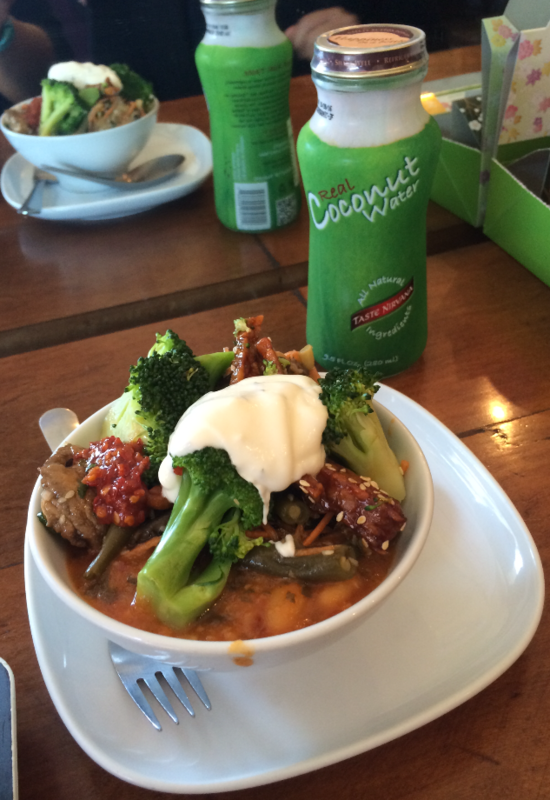 It was a great vegetarian option. The rice-cakes soaked up the sauce so well and each bite was full of flavour. 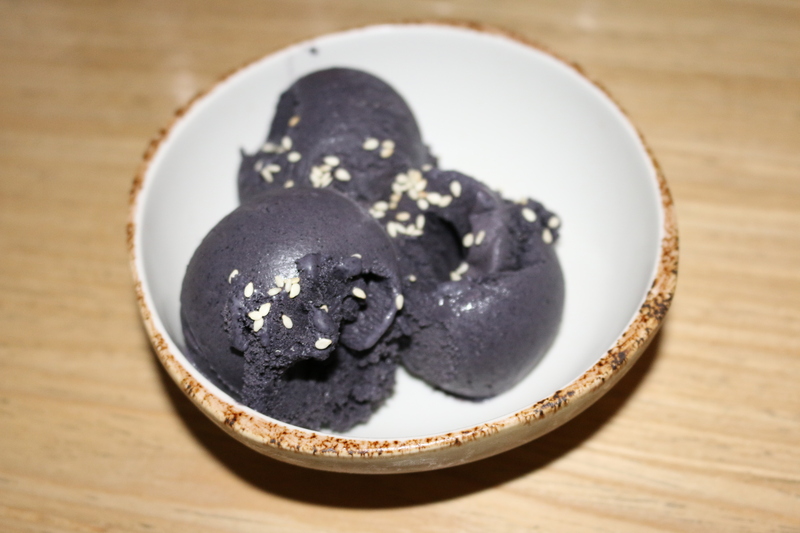 The black sesame ice cream looked fantastic. It was smooth and the flavour was nutty sort of like tahini. I’m not a huge black sesame ice-cream fan but this was pleasant. The apple & walnut tart was delicious. It had thin slices of soft apple and a crunchy walnut crumb on top. 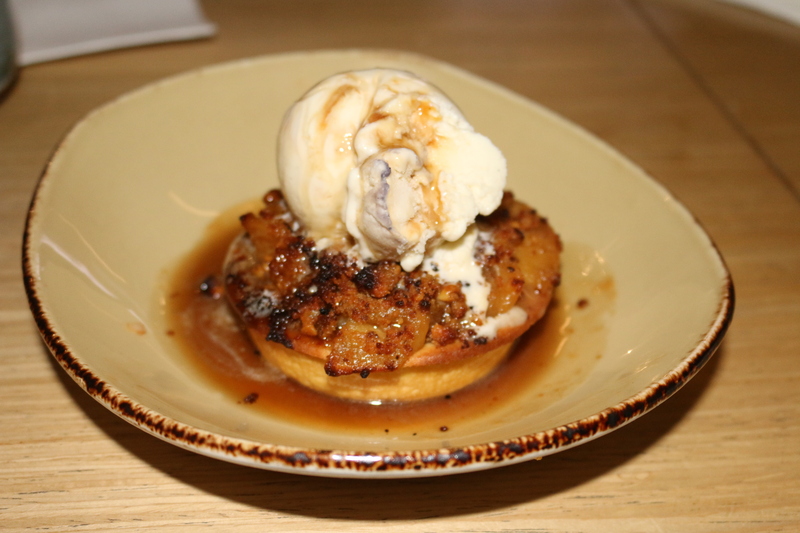 There was miso butterscotch poured on, over and around the tart, which was a thin sweet and sticky sauce. On top of the tart was a scoop of Japanese whisky ice-cream. 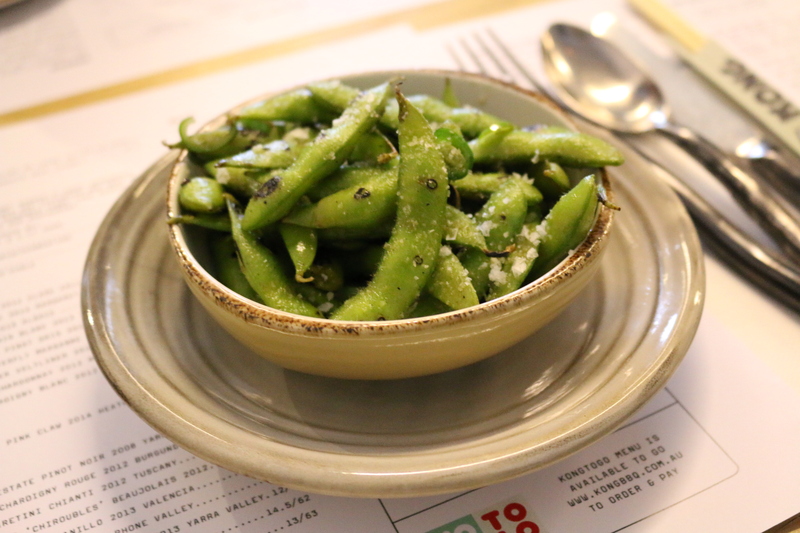 The Japanese flavours take this dish to another level. It has the essence of a traditional apple pie but with a modern Japanese twist. It’s a good one for winter. 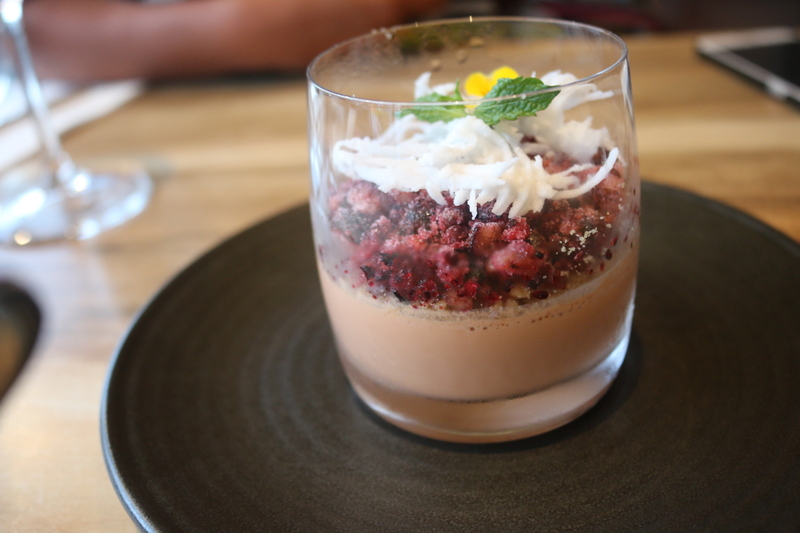 The coconut sago trifle was heavenly. 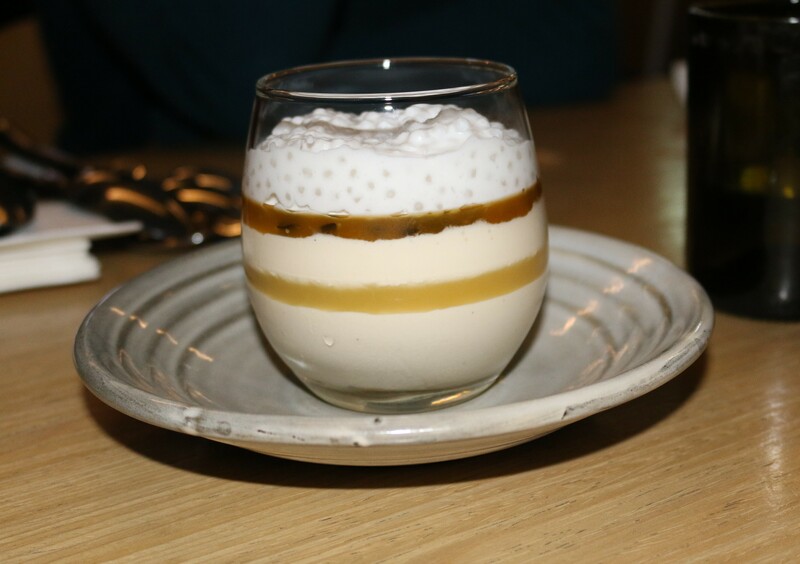 The sago was covered in creamy coconut, the passionfruit layer was a burst of fresh fruit and the pineapple layer tasted sweet and caramelised. Absolute bliss. It’s a walk in restaurant so you can’t make a booking and it gets really busy so you can expect to wait over an hour at peak times. We left our name and number and visited the pub down the street (Prince Albert Hotel) for some drinks to pass the time and they called us when our table was ready. You also have the option to take-away if you prefer. 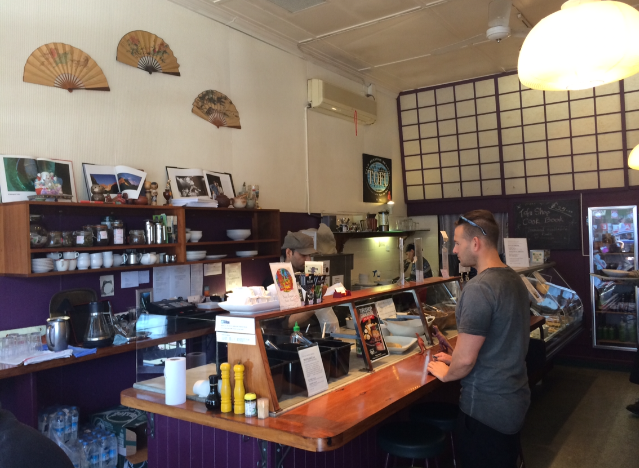 The food came out pretty quickly and the staff were fantastic, very friendly and attentive. And the food was full of flavour and super tasty so definitely worth the wait. When I heard there was a place that had tofu in almost every dish I was excited. I love tofu! 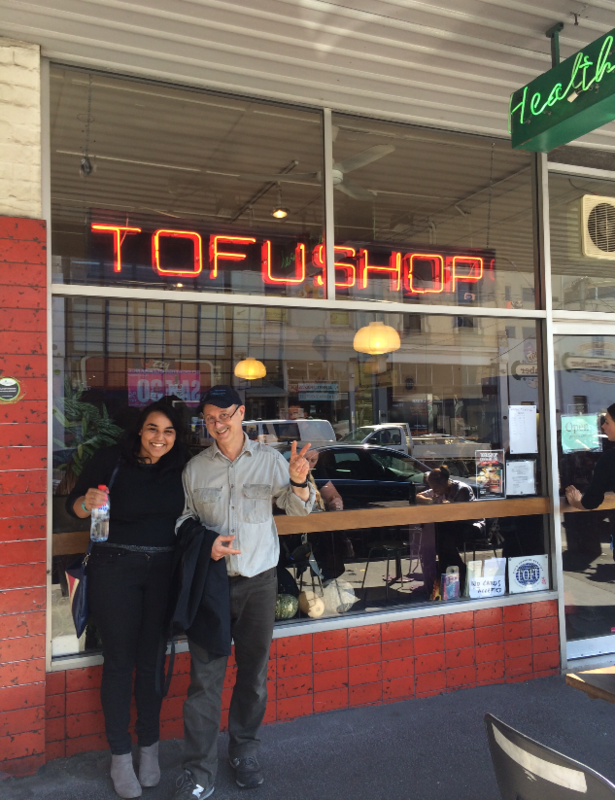 I’ve heard good stories about the Tofu Shop International for a long time so it was about time we visited. As we walked in we were greeted with a warm welcome from the owner Malcolm who had opened the shop over 30 years ago. When he heard it was our first time at the store he gave us a quick intro on the background of the store and guided us through the menu options. He really made us feel at home. The cosy little store had shelves with jars of herbs, ornaments, teacups, open books and paper fans on the wall, which sort of made you feel like you were in someone’s home. It was nice. The foods were displayed at the counter in bay maries with handwritten pieces of paper informing you of what each dish is and what the menu options are for the day (which regularly changes). 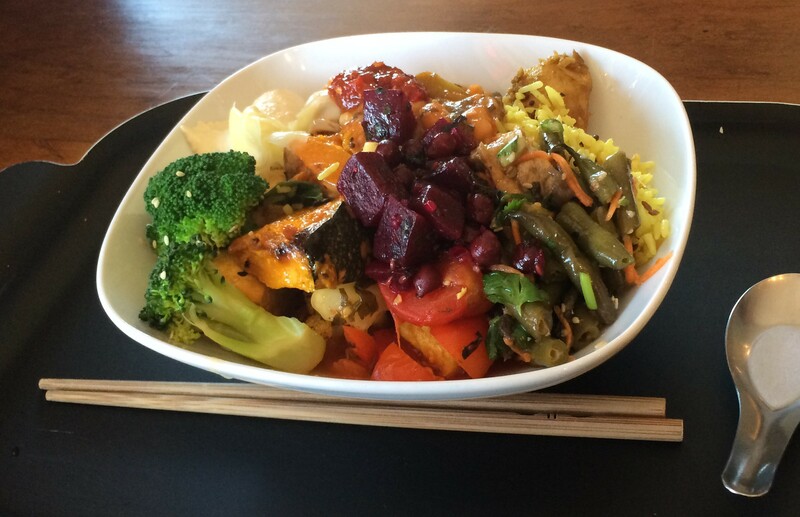 Depending on how hungry you are, you can opt for a small, medium or large sized serving bowl. Then you can select as few or as many dishes that you want. I got a medium bowl with a little bit of everything, it was delicious. I loved that I could taste everything in the one meal and wasn’t limited to choosing just a few options. Everything was yum. There was a green bean sweet chilli tofu salad, which was really tasty and a tomato tofu bake, which was yum too. There was a ginger tofu in an Asian broth, which was one of my faves. The tofu was infused with the lovely flavours of the broth. There was also baked pumpkin w sage and garlic, broccoli w tempeh, black chickpea and beetroot salad and cauliflower & carrots. 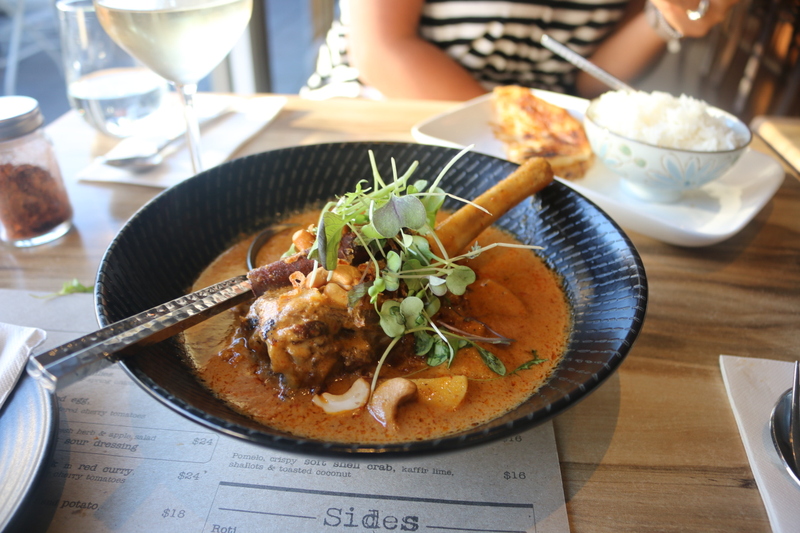 There was a satay potato curry, which was a dry peanutty curry (which would go really well with chicken, said the meat-eater in me). There was a white bean pot w spinach, tomato & paprika, and a chickpea pot w saffron and porcini mushrooms. They were sort of like stews and were two of my fave dishes. The saffron spice rice w fig and curry leaf had a really nice flavour and they also the option of brown rice if you wanted. Then on top of all that you had the option to include some condiments, they had soy dip, yoghurt dip, chilli and pickled ginger slithers (sort of like the ones you get with sushi). Each dish had a different flavour and texture but they all went well together on the same plate. It was a delicious and hearty meal. Next to all the delicious savoury foods there was a display of tofu inspired desserts like tofu apple crumble and banana macadamia tofu slice. Yum! Also they had soy ice-creams in a range of flavours. They had coconut, chocolate, pandan and green tea. 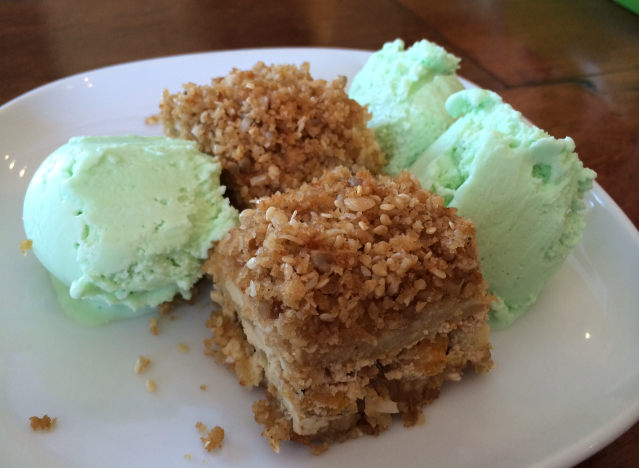 We had the tofu apple crumble with pandan ice-cream. It was good. 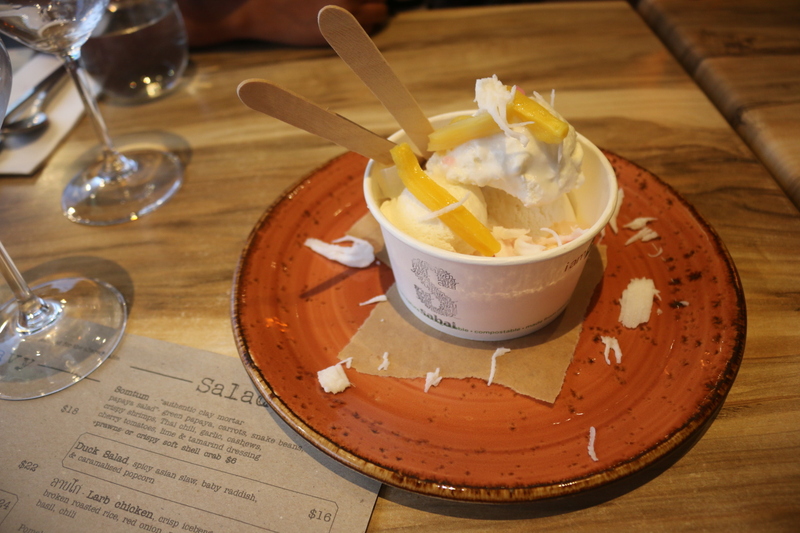 The crumble had thin slices of apple, layers of tofu, pieces of dried apricot and a soft seedy crumble. The food was honest and humble and absolutely delicious. It was really fun to eat tofu in so many different forms. They even had a Soyvalaki (a soy souva) and a soy patty burger. Just remember to bring cash because they don’t except card. If you forget dw there are a ATM’s nearby. I heart Tofu Shop International! 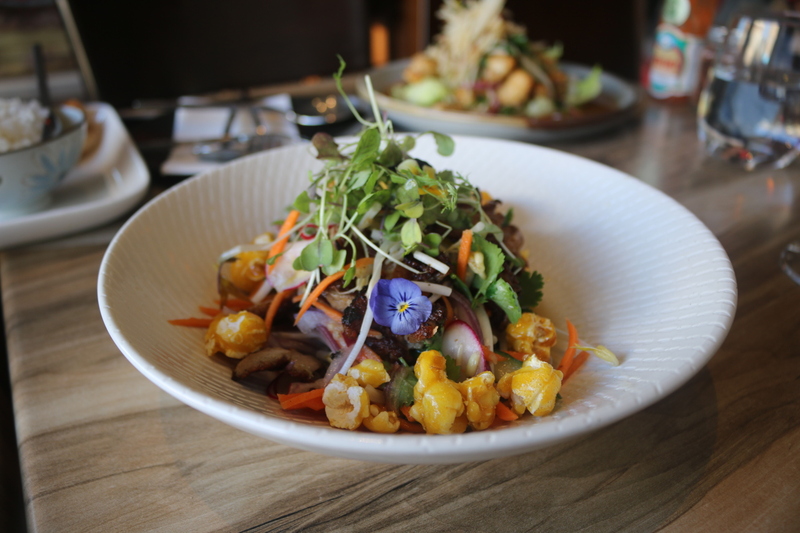 At Top Paddock the menu is centered on using the finest ingredients and sourcing local produce to use in their meals. You can see the love that has gone into the preparation and presentation of the dishes. The ingredients are treated with respect and everything on the plate compliments the dish. They’ve used recycled materials in their décor where they can. If you look closely in the photo above in the bottom left you can see the tops of the stools are made out of recycled parking signs. So I suggest you park your toosh onto one of these chairs and get eating. 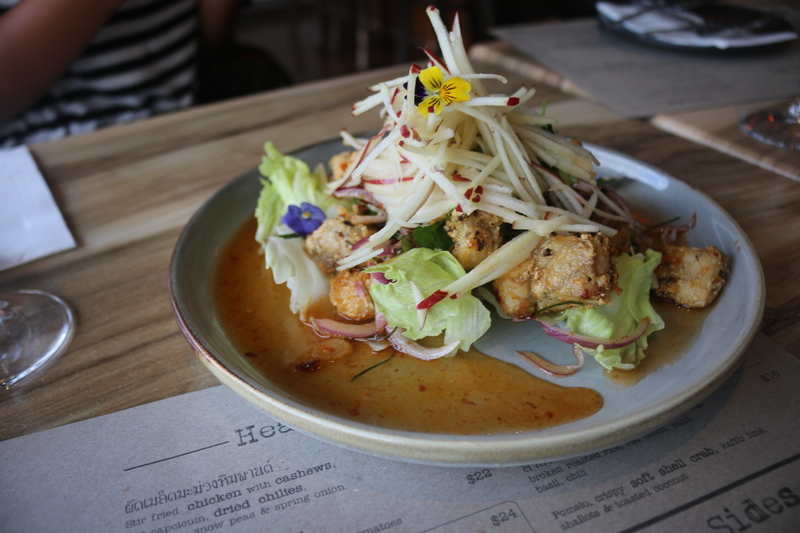 Top Paddock – Fresh QLD soft-shell mud crab roll. 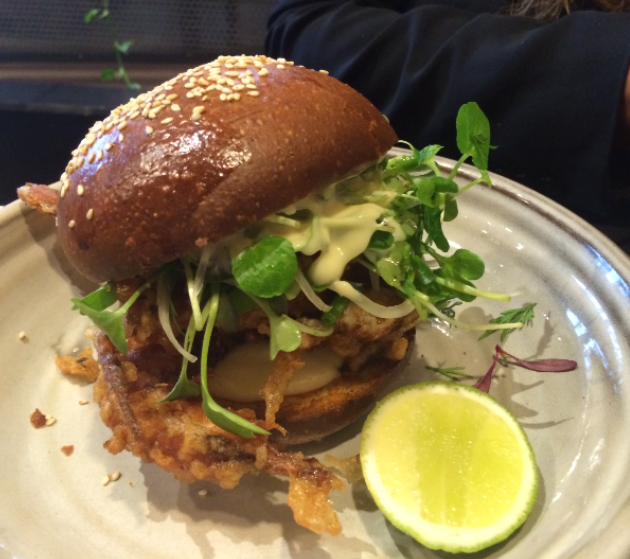 My friend ordered the fresh QLD soft-shell mud crab roll with a fennel & dill salad & lime mayonnaise in a brioche bun. The crab was battered and had a nice crunch. The buttery brioche complimented the creamy crab and the zing from the lime in the mayo gave it a real freshness. It was delicious! 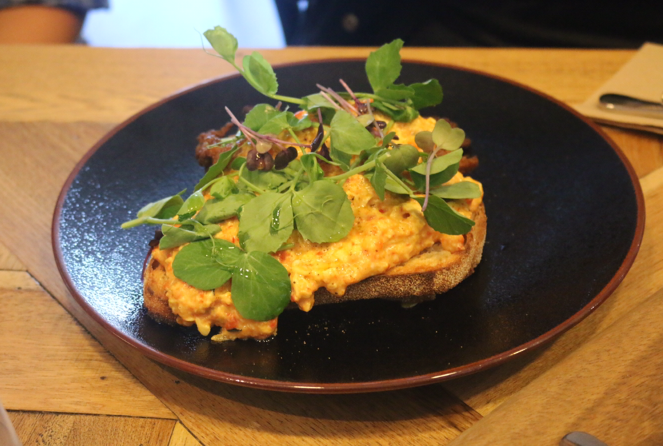 Top Paddock – Big Breakfast. I could smell the delicious aromas when my meal arrived. I ordered the Top paddock, which was a big breakfast with style. 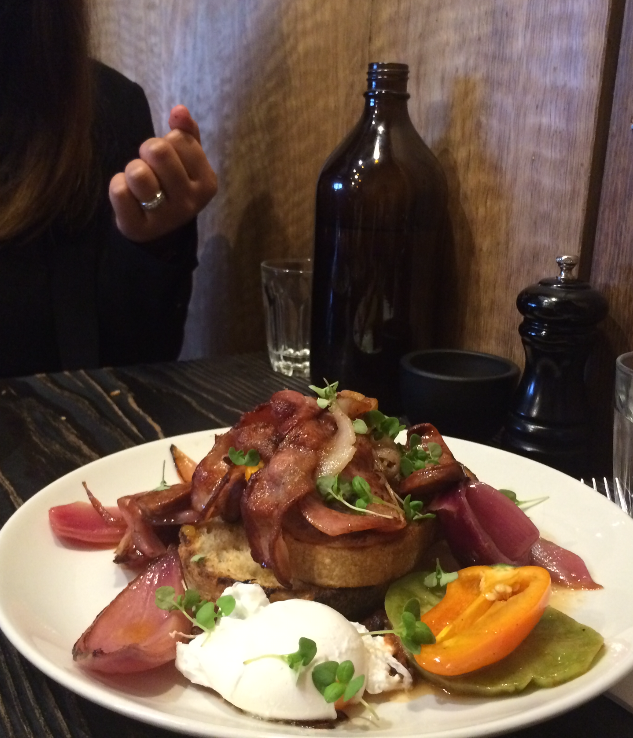 It had chorizo, pickled onion, peppers, basil, bacon, Adelaide green tomatoes, poached eggs & relish on toast. It had a really great balance, the pickled onions were sweet, the bacon was the salty component, the peppers had crunch, the basil was fried and the eggs were perfectly poached and runny when you cut into them. The relish was rich and tomatoey and went with everything on the plate. Each element tasted delicious individually and when you mixed it together it was even better. What caught my eye was the tomatoes. They were green. They looked like tomatoes, they tasted like tomatoes but they were green. Green eggs and ham I’ve heard of, but green tomatoes and bacon, I have not, I like them a lot, I would eat them here or there, I would eat them anywhere (just to clarify, I was trying to be Dr. Suess in that last sentence). Top Paddock – Blueberry and ricotta hotcake. 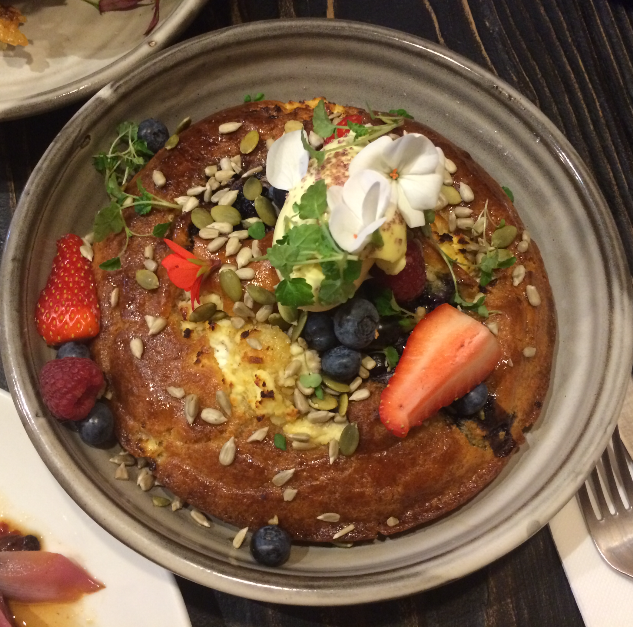 We ordered the blueberry and ricotta hotcake with berries, organic maple, seeds and double cream. It was amazing! It was light and fluffy and warm and melted in your mouth. The top of the hotcake was golden and crispy around the edges. Yum! Yum! Yum! Inside the hotcake there were little pops of blueberries and little pockets of ricotta. There was bits of the hotcake that had absorbed the maple mmm extra sweetness. There was a quenelle of double cream on top to eat with each bite and seeds and flowers scattered across the hotcake. It looked spectacular and tasted incredible. It was really delicious! At first we were really full after out savoury dishes and didn’t think we could eat much of the hotcake. After one bite of that hotcake I felt like I could eat 10 of them. My tastebuds took over and demanded that my stomach make room for this heavenly hotcake. 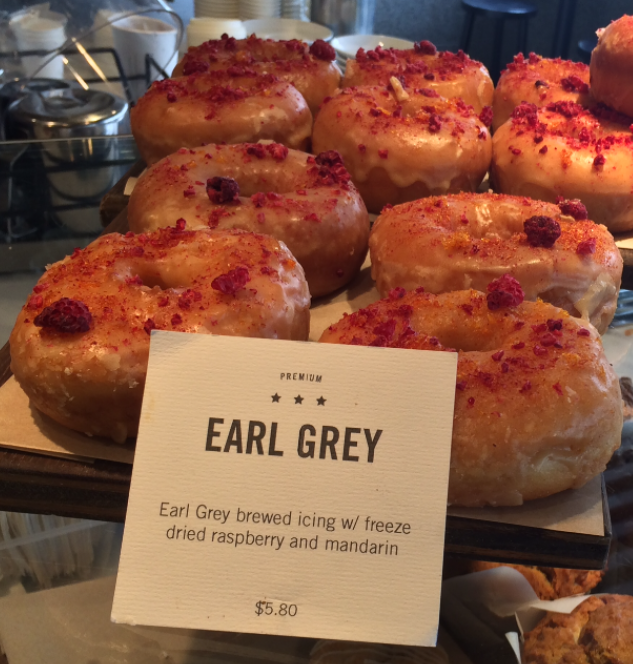 Top Paddock – Earl Grey Donuts w freeze dried raspberry and mandarin. They had some interesting baked yummies at the counter. They had these mouth watering donuts which had earl grey brewed icing w freeze dried raspberry and mandarin. 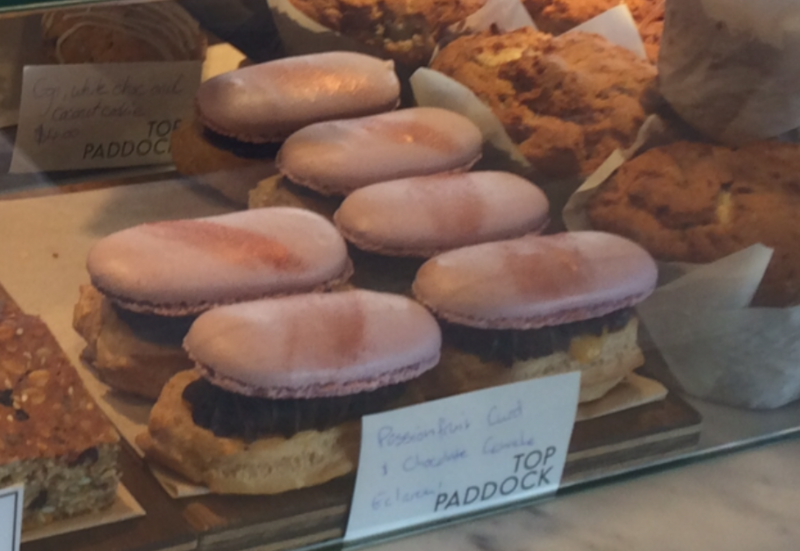 Top Paddock – Eclarons (half eclair, half macaron…strange little fellas). They also had some hybrid desserts like the half cheesecake, half brownie, chocolate cheesecake brownies. And the eclarons which have the powers of an éclair and a macaron combined into one. What the yum? Definitely first time I’ve seen one of those. The eclarons were filled with passionfruit curd and chocolate ganache. I was way too full to eat that strange looking fella at the time but in hindsight I should have taken it home to eat later. Ah wells I’ll just have to go back again very soon. I enjoyed the food it looked fantastic and each meal was cooked with love. It’s definitely a place you want to make your local. 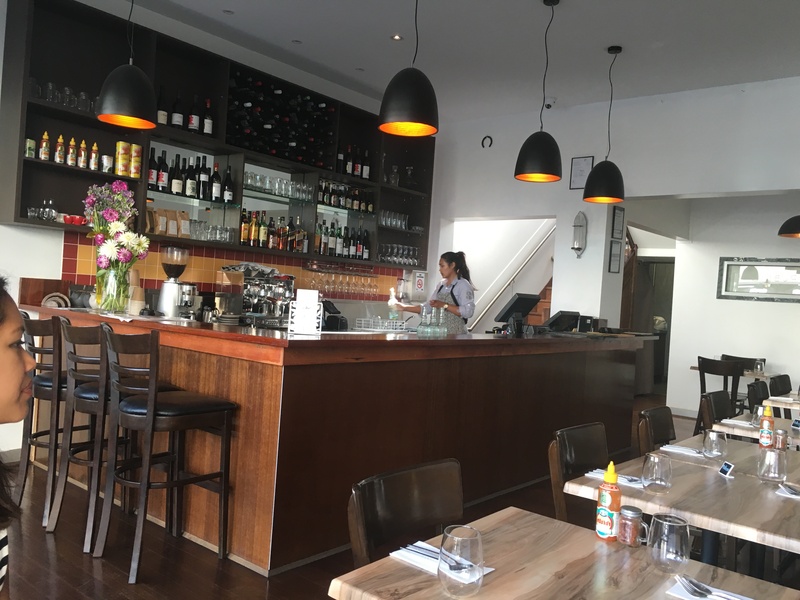 It’s got a great open atmosphere and good service. 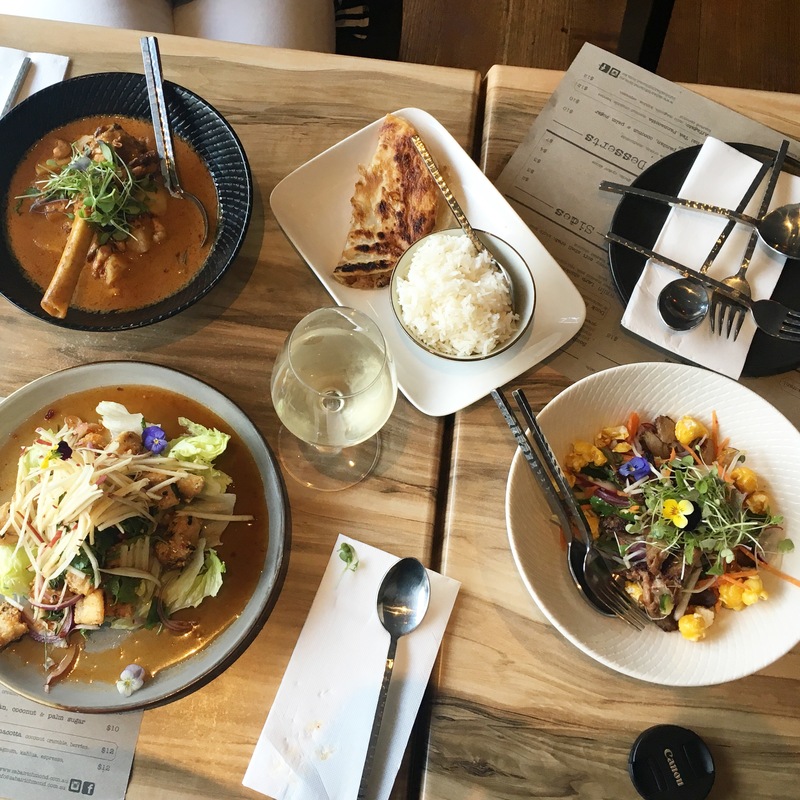 Weekends can get very busy though so you might have to wait a little for a table but it will definitely be worth the wait.